The Ministry of Education and Culture to develop stub programs 12-years compulsory education. One of the program purpose is to give opportunity to all people, especially the econimacally disadvantaged to obtain secondary level educational sevices, especially high school. To achieve the goal of the government stub program Compulsory 12 has set up a School Operational Assistance (BOS) High School that will be distributed to public and private high school across Indonesia. One of this SMA BOS program purpose is helping schools to meet the non-personnel operating costs. The issue is raised in this research is how the quality of operational fund delivery service in the high school level that given by the Tanjungpinang city department of education and culture. 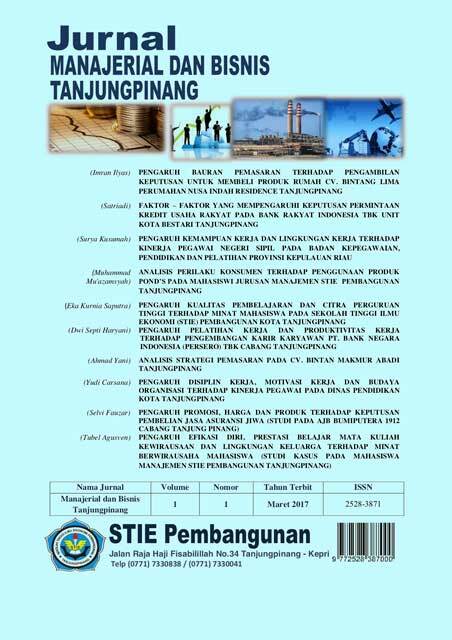 This research’s purpose are to describe and analyze the quality of public sevices in the distribution of BOS funds high school level in Tanjungpinang city. This research used a qualitative research model with data collection technique through interviews with instrument data collecting interview guide. The informan in this research is KASI SARPRAS of high school education department, kasi sarpras High School as the responsible management of BOS funds high-school level. The results from this research : The level of Service Qualty Distribution of BOS funds, this can be seen from the delay in funds that go into the school’s account.